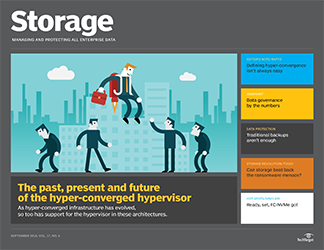 Hypervisor support in hyper-converged infrastructure has evolved over time. Find out how as we assess the past and current place of individual hypervisors in these architectures. Emerging technologies, such as AI and IoT, in the age of big data mean there's more data than ever to benefit from and for data governance policies to manage and secure. Traditional backup or data snapshot and replication technologies alone don't meet the data protection and DR needs of modern enterprises. Combine them all together and they do. Defining hyper-convergence can be a challenge. Focus instead on learning about hyper-converged infrastructure product options and how they fit your data center and cloud plans. Storage vendors advance silly and not-so-silly claims about how data backup and protection technologies are the answer to ransomware prevention and growing ransomware fatalism. The extent to which the recently published FC-NVMe standard lowers performance latencies in Fibre Channel SANs will be interesting to watch in the coming months.